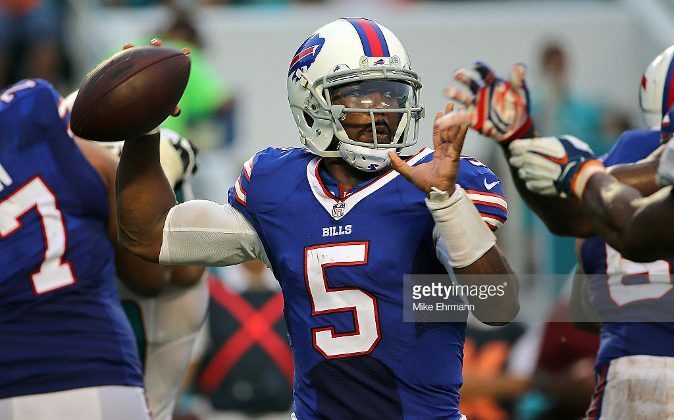 Tyrod Taylor #5 of the Buffalo Bills passes during a game against the Miami Dolphins at Sun Life Stadium on September 27, 2015 in Miami Gardens, Florida. A look at the risers and fallers on the fantasy football stock market for Week 4. Dalton has had an superb start to the 2015 season, being ranked third in scoring behind only Tom Brady and Aaron Rodgers. Could this be the year where Dalton finally makes the leap into the elite class of QBs? Dalton is a red-hot lower-tier QB1 heading into Week 4’s matchup with the Chiefs. Who could have predicted at the beginning of the year that a Bills quarterback would be in the QB1 conversation? Well Tyrod Taylor has thrown for 242, and then 277 yards and 6 total touchdowns over the past 2 weeks. As an extra incentive, Taylor gives a rushing bonus, with 90 rushing yards and one rushing touchdown on the year. With the opponent Giants defense struggling, Taylor certainly is an QB1 option in Week 4. Jones was considered an elite fantasy option at receiver coming into the season, but he has been on another level thus far. Jones leads the NFL in targets with 46, including 20 in Week 3, which he converted into 164 yards and two touchdowns. On the year, Jones now has 34 receptions for 440 yards and four touchdowns. With the 3–0 Falcons clicking on all cylinders, Jones is widely considered the best receiver option in football coming into his Week 4 matchup with the Texans. Randle does lose some work to backups Lance Dunbar, who nearly doubles as a receiver with his production in the passing game, and Darren McFadden, who vultured a touchdown from Randle in Week 3. But there’s still plenty of work to go around in the Cowboys backfield, and Randle took full advantage in Week 3, totaling 87 yards on 14 carries and three touchdowns. On an offense missing Tony Romo and Dez Bryant, Randle’s role on his team has soured him into the RB1 ranks versus the Saints in Week 4. The only cause for concern is that teams are going to start stacking the box, which we already saw in the second half versus the Falcons. After totaling 85 yards on his first three carries in that game, Randle managed just 2 yards on 11 more. The new Derek Carr-Amari Cooper show in Oakland hasn’t disappointed. Cooper handily won his matchup with Joe Haden in Week 3 versus the Browns, catching 8 out of 11 targets for 134 yards. Cooper is now up to 290 yards and a touchdown on the year. This puts him on pace for 1,500 yards on the season, so though it’s only been three weeks, we do expect his production to dip a bit. With Ty Hilton dealing with some injuries and Andre Johnson being exceedingly ineffective as a Colt, Moncrief has flashed his tremendous upside during his sophomore season, notably with 122 yards and a touchdown in Week 2 versus the Jets. Moncrief was more quiet in Week 3, but still salvaged his fantasy day with a go-ahead touchdown to give the Colts the lead in the fourth quarter. Moncrief is looking like a low-end WR2 option facing the Jags in Week 4. The man formally known as CJ2k seems to have gained new life in Arizona, showing explosive playmaking ability en route to 110 yards on 22 carries in Week 3. Andre Ellington now looks to return from his knee injury, but Johnson will maintain a relevant role, and can be looked at as a RB3 versus the Rams this week. Anderson continues to make his magical second half of 2014 look like a fluke. In the first three weeks of 2015, Anderson has managed just a paltry 74 yards on 32 carries, good for 2.3 yards a carry. In Anderson’s defense, he has been playing with ankle, toe, and head ailments, and the Broncos’ running game as a whole has been struggling. But the fact of the matter is, Ronnie Hillman continues to receive a large chunk of carries, which further cuts into Anderson’ production. Until Anderson shows some signs of life, he is no more than a low-end RB2 in Week 4. Like Anderson, Miller was a diamond in the rough free agency find last season. Unfortunately in 2015, the Dolphins have puzzlingly abandoned the run game. With just 30 carries on the season and 105 yards and no touchdowns to show for it, Miller can not be trusted as any more than a low-end RB2 in Week 4. Murray has had the worst possible start to his Eagles career. Murray was unbelievably ineffective in Weeks 1 and 2, totaling just 11 yards on 21 carries, and then had to sit out Week 3 due to a hamstring injury. To make matters worse, Murray is not even the unquestioned leader of the backfield anymore, as backup Ryan Mathews breathed new life into the running game with a 108 yard performance in Week 3. Murray is currently questionable to play in Week 4’s bout with the Redskins.